Submitted by Migrate Wizard on 2014-10-18 08:58. 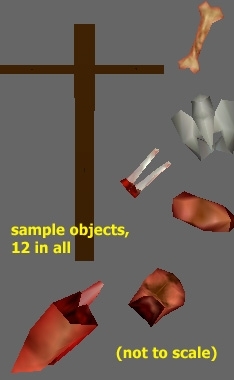 This package adds extra gore placeables for use in Ogre caves and other lairs. Included are 12 different items, including: arm, big bone, giblet, pelvis, and thigh, to name a few. You also get two different kinds of crucifiction and one empty cross. If anyone uses the crosses to make a Christian themed mod, please let me know so I can try it out. It has a pre-padded SOU 2da file. Example mod, erf, and hak are included. Please READ THE INCLUDED gore_readme.txt file for lots more information. This is version 3.1 with slightly altered 2da file and different screen shots and sample module. The 2da should now compatible with NWN's default 'no gore' option. I had to turn comments and voting off because people were behaving poorly. I think it had a score of 8.5. Enjoy!